Oath: Ad Platforms (Yahoo Gemini), one of AppsFlyer's integrated partners, offers search and native advertising in one advertising platform. In addition to click-based mobile attribution, Oath: Ad Platforms also offers cost, retargeting and view-through attribution, which you can track with AppsFlyer. 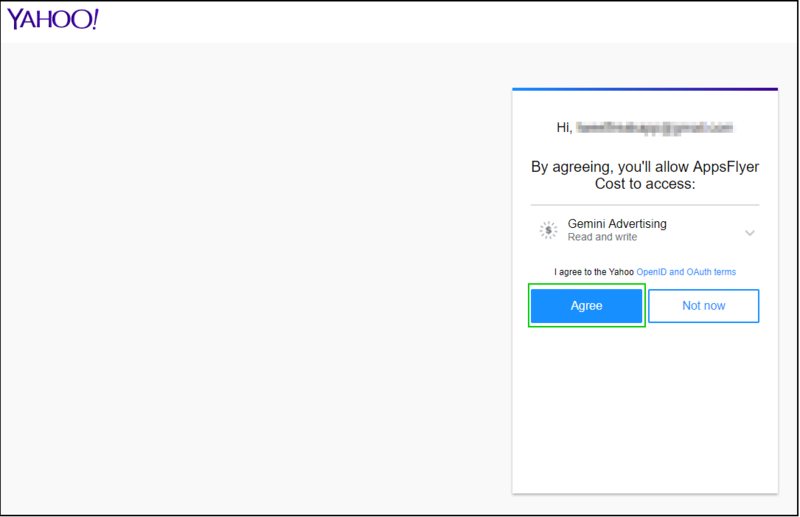 To configure your campaigns with Oath: Ad Platforms, follow the steps below. The OATH Ad Platforms integration does not support EU user targeted campaigns at this time. Enter "Oath: Ad Platforms" in the search field and click on its logo to open the Oath: Ad Platforms configuration window. The Oath: Ad Platforms configuration window includes 3 active tabs: Integration, Cost, and Permissions. Click on the items below to read about the tabs setup. The General Settings step in the Integration tab is mandatory. All other steps are descriptive or optional. On the first visit here, you will need to toggle ON the Activate Partner button to enable setup of the integration tab's parameters. The toggle MUST be ON for as long as you work with the partner. For more details about partner activation please click here. This slider allows you to set the maximum time from click to install. Only installs (first launches) that take place within the lookback window may be attributed toOath: Ad Platforms. Toggle this to ON if you want to attribute view-through installs from Oath: Ad Platforms. The view-through lookback slider is available on the tracking link tab (described below). 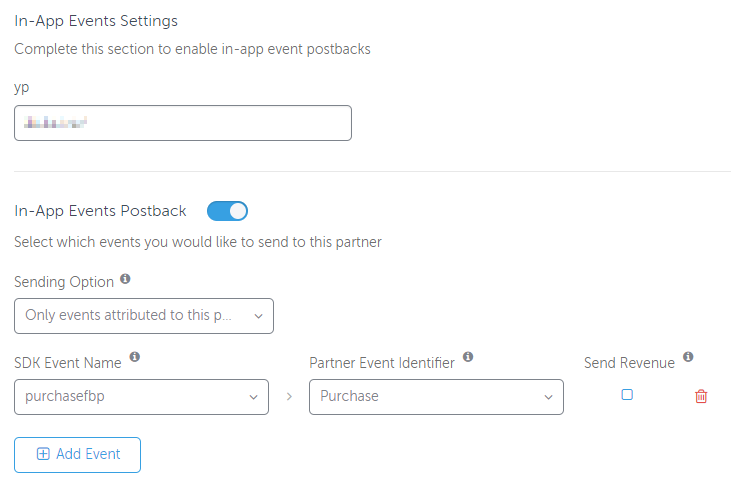 In this section, you can map your AppsFlyer events with Oath: Ad Platforms via postbacks. Submit the yp parameter provided by Oath: Ad Platforms. On Oath's dashboard it is called In app events - Dot tag ID (see below). Partner Event Identifier The unique name or ID of each event as defined on the Oath: Ad Platforms side. Obtain the corresponding Event ID from Oath: Ad Platforms and set in the text field. This tab is not applicable for Oath: Ad Platforms. For all SRNs, such as Facebook, Apple Search Ads, Adwords, Snapchat etc. this tab is not functional, as they do not use external tracking links. The Cost tab allows you to receive cost data. Select the Get Cost, Clicks and Impressions data toggle. Click API Authentication to redirect you to your Yahoo account. If you are not signed in please do so and then press the below highlighted Agree button. Make sure that you log in to the Yahoo account that you are running the campaigns from. "You have successfully connected Oath: Ad Platforms cost data." Close this tab to return to the AppsFlyer dashboard. Once you set Oath's cost do not change the name of any running campaign, ad set or single ad, as it may cause serious discrepancies or missing cost data. In this tab, you can select the permissions to grant Oath: Ad Platforms. Note that even if attribution is disabled for Oath: Ad Platforms, the permissions tab is active and you can grant control to Oath: Ad Platforms. AppsFlyer receives the following parameters from Oath: Ad Platforms and map them to the following fields in the raw reports. When you enable attribution for the first time, it takes up to 4 hours to be reflected in the Oath: Ad Platforms UI. Currently agencies are not able to track campaigns on Oath:Ad Platforms (Yahoo Gemini) via AppsFlyer.